Where to buy Faulhalber motors? How to make the choice? Due to the popularity of building a 4 wheel mouse got significantly increased. I had a lot people emailed about where they can buy faulhaber 1717 motors. Here I am posting links about the site of the regional distributors. So far I found UK and US. The link for UK is provided by My Peter Harrison. All purchase from Micromo used to made through the local representives by making a quotation first then make a purchase with either credit card or purchase order. You will need to tell them your credit card number through phone if you choose credit card(sounds really old school). But now the thing has been changed, after they launched their own online store. Now you can pretty much find the 1717 motor with all voltages(even include 3V motors). Also, seems the 25 minimum purchase for 3V motor is gong since I saw there are price break starting at 1 piece(you can buy minimum 1 motor). I also noticed Faulhalber has already launched their upgraded version of IE2 encoder called “IEH2”. It basically extends the max CPR from 1024 to 4096, with increased reliability at lower speed, also some thermo performance improvement(for encoder). The motor remains the same, and the motors attached with IE2 and IEH2 are both available. Interestedly, the IEH2 version is even cheaper than IE2. Unfortunately, they don’t have the either IE2-512 or IEH2-1024 for both 3V and 6V listed on their store. You might need to ask them through Email. However, this is still becomes much easier for those who want to buy 1717 motor for their micromouse. Hopefully, I will be able to buy a pair of 1717T003SR motors with IEH2-512 or 1024 during summer because most of the 1717T motors have at least 20 days factory lead time. PS. 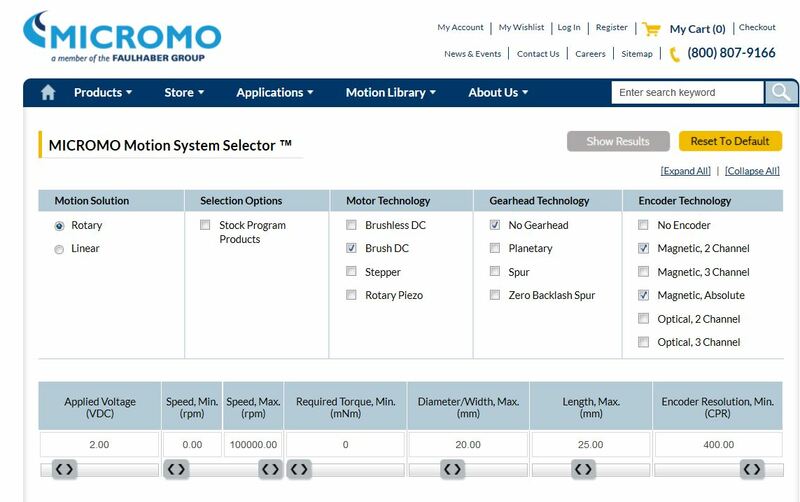 the screenshot I put on the top is how I filter on their online store in order to find all 1717T motor with encoders. This entry was posted in Mechanical by Green. Bookmark the permalink. Sadly, Micromo will not accept online orders from the UK. If ordering from Micromo in the US, can you say what taxes/postage would get added to the cost? The prices shown are very good compared to UK. Indeed. still, 15-25mah is totally affordable. Much less power consumption than IR sensor on 5V power supply line. Do you think buying IEH2-4096 is a good idea? I can not make up my mind which one to go with, 512 or 4096. I think that the 4096 with produce a lot of noise signal, doesn’t it ? trying not to purchase the max resolution version for either encoders. If you read datasheet, you will find the max resolution version(4096 for IEH2 and 1024 for IE2) has less max speed limit. thanks for the info, I got a question for you. Why do you use 3V motors instead or 6V? 3V has halfed the resistance than 6V version. It will provide more power than 3V when using same battery. So, do you drive your motors using a H-bridge connected directly to the 7.4v Battery? and don’t you burn your motors if are specified 3V? motors got hot after continuous speed runs.